Is consumer loan risk higher than mortgage loan risk? I was prompted to write this article in response to the article “Investments in mortgage loans: warning about the risks” (in Lithuanian) in the Opinion Section of Verslo Žinios (VŽ). Although the article in VŽ contains many logical and fair insights, I also found some inaccuracies. So in this article I task myself with clarifying the topic as I and other experienced specialists in the area and investors understand it. In other words, I will try to answer the questions as to what consumer loans are and how they differ from mortgage loans issued to business entities (commercial mortgage); how risky are consumer loans compared to mortgage loans; what is the chance of recovery of these loans where the borrowers become insolvent; and how should recovery take place in a period of economic slowdown. Consumer loans are loans which are only issued to private individuals, they may not exceed EUR 75,000, and they are issued without any collateral. Such loans are issued by banks, consumer loan companies, and peer-to-peer (P2P) lending companies. The principles, provisions and requirements for the issue are described in the Law on Consumer Credit, which defines the issue and administration of such loans, and the relationship between the borrower and the creditor. It is important to note that a consumer loan may not be issued using real estate as collateral as this would no longer be a consumer loan and it would not be covered under the definition of consumer loan under the Law on Consumer Credit. In other words, a consumer loan is a loan to a person or a family without any collateral. Nevertheless, since man is the base of the economic pyramid, we understand that in this case the “collateral” is the human ability to earn income which will be used to pay back the loan. Compared to other types of loans, consumer loans are very small. They are repaid on an annuity basis, i.e. each month the borrower pays a portion of the credit and interest. Mortgage loans are regulated as defined in the Law on Real Estate Related Credit or the Law on Crowdfunding. The fundamental difference between a consumer loan and a mortgage loan is its borrower. Since pledging real estate to finance business is popular in Lithuania, according to the Law on Crowdfunding, a mortgage loan may be granted to a business entity: it could be a private limited company, partnership, a self-employed person or another business entity. When a loan is granted via the crowdfunding platform, to secure repayment of such a loan, real estate may be pledged for the benefit of investors. I would like to provide some insights into granting loans to businesses by pledging real estate via the crowdfunding platforms. The average amount of such mortgage loans is many times greater than that of consumer loans and, based on the information of such platforms, is EUR 150,000 on average. The loan-to-value (LTV) amount is usually 50–80%. Unlike consumer loans, the mortgage loan is usually paid back at the end of the term and only interest is paid every month. Business entities usually take such loans for real estate development or other business aims and the loan repayment takes place following the sale of the real estate or other profitable business transaction. It is the loan amount which in fact is the cause of a small miracle, specifically that the mortgage loans are riskier for the investor than consumer loans. At first sight this looks strange. It would seem that if the loan is secured by pledging real estate, it is safer and the investor expects to recover the entire loan amount, because it will be possible to realise the pledged asset. However, in reality the situation is slightly different: the average amount of a consumer loan on the platforms in Lithuania is about EUR 2,600, while that of a mortgage loan is EUR 150,000. During economic growth, mortgage loans are considered less risky than consumer loans, but interest on consumer loans is higher thus generating a higher return on investment, which currently stands at 13% annually. The annual return on mortgage loans on crowdfunding platforms currently stands at 10–11%. As far as the loan maturity is concerned, the choice is greater in the consumer loan market – from 3 to 60 months (3 to 24 months for mortgage loans). Thus, investors naturally select a diversity of investment by investing in both types of loans. Thus, everything looks very nice – the risk is diversified by investing in different assets. This is, however, only the case during periods of economic growth. And we only actually find out why this is so, i.e. why consumer loans will generate a higher return than mortgage loans during a period of recession. To repeat. The fundamental difference between these loan types is the loan amount. During periods of economic growth this does not have any serious affect, but during a crisis the situation changes significantly. Why? A crisis primarily affects enterprises, not people. There is always a delay in making people redundant and often redundancy does not help company survive anyway. Looking back at 2009, the situation was as follows: corporate earnings fell severely and it became difficult to repay mortgage loans. And we are only talking about interest payments, let alone the outstanding loan balance. Businesses, of course, tried to sell real estate, but the liquidity was low, they did not want to sell cheap, so there was an almost desperate search for buyers. In the meantime, the buyers were equally afraid, although, most likely one or two would have bought real estate for half price. Nevertheless, the above-mentioned LTV amount is more frequently 50–80%, therefore, the sale of real estate often does not generate enough money for loan repayment. The pledged real estate is usually not attractive, because the more attractive it is the more likely the bank will finance it. Although, of course, the bank may not finance it, if they think the real estate developer is not experienced enough, i.e. the bank considers the project too risky due to the experience or financial status of the developer. So, when the crisis strikes, a large portion of mortgage loans, depending on how hard the crisis is, may become ‘non-performing’. The percentage of such loans is unpredictable, but compared with the period of economic growth, the default rate, i.e. the percentage of non-performing loans will increase significantly. In the case of consumer loans, the percentage of non-performing loans will increase, but by less, because, as has already been mentioned above, man is the last chain of the economic pyramid and will only be made redundant after the company has already been hit by difficulties. He will receive incapacity benefits, redundancy compensations, and only then run out of funds. We invest in consumer loans in the hope that the borrower will earn income and repay the loan on time. It is impossible to write off personal debts until repayment is completed; the debt will follow the borrower all his life. It is true that declaring bankruptcy may be a way out, but it is not as simple as that in Lithuania. Let us look at the example of an emotional picture of a human being, i.e. what he is thinking and what he would do in the case of both the consumer loan and a commercial mortgage. In both cases, the loan was repaid for a third of the term. The remaining balance of the consumer loan is EUR 2,000 and in the case of the commercial loan – EUR 150,000. The borrower (consumer loan) is made redundant, while the business (commercial loan) revenue significantly diminishes. In both cases it is assumed that the debts are in default. In both cases the borrowers lack savings or capital in order to be able to survive for at least one year. What would the private person or business owner do in each case? In the case of a consumer loan, the borrower does not see it ‘as the end of the world’. He understands that when he finds a job his life will be back on track. So, he will look hard for a job. It will be more emotionally difficult for him to be unemployed, than to have the loan. He will incur debt recovery costs of about EUR 500 if he fails to reach an amicable agreement with the creditor. In the worst case, the bailiff will take over the loan, which will cost the debtor and the loan will increase to EUR 2,700. Let’s say that he only manages to find a job after three years. If the loan is not being repaid over the period of those three years, the delay penalty will be calculated in the amount of the initial payment interest, therefore, within the three years EUR 900 in delay interest (on the loan of EUR 2,000) will be calculated and the total debt will be EUR 3,600. During this time the borrower may think of bankruptcy, but as I have already said it is a complex and expensive process, the debt, according to the Law on the Bankruptcy of Natural Persons, will have to be paid in instalments to the creditor for a period of 3 years, so going bankrupt is not financially worthwhile. Instead the person finds a job and, after three years of non-payment, starts repaying the debt and does it successfully over the next three years. It is worth noting that the debt to the investor will have to be paid including delay interest, which is especially important, because in such a case the investors do not lose money over time and while the money was lent, they calculate interest (in this case – 15%), so they are not affected by the crisis. Furthermore, the investor receives 5% interest of the proceedings stipulated in the Civil Code and calculated by the bailiff, which the investor is entitled to as the creditor. So, finally an investor or another creditor earns even more from the loan than it would have earned had the loan been paid on time. This was typical during the 2008–2009 crisis – approximately 80% of default consumer loans were in this situation. So, in this situation the investor is rescued by a simple factor – the small amount of the loan, which makes it worthless for the borrower to go into hiding or to go bankrupt. But what will, happen in the case of mortgage loans? First of all, a greater portion of the loans of the entire loan portfolio will become non-performing, than in the case of consumer loans. This is one factor which reduces return to investors. But there is also another, to my mind more important factor – in the case of recovery of non-performing loans and the sale of real estate – only a small portion of the loans of all non-performing mortgage loans will give a return to investors over time. Let’s imagine: business bank accounts are blocked, bankruptcy is filed for, and the crowdfunding platform has the primary mortgage option, which means that the property will be realised for the benefit of investors. Let's make a typical assumption that the loan was pledged with 70% LTV, so the value of the real estate at the moment of pledge was EUR 214,000. The borrower is having difficulty selling the property: he manages to find a buyer who agrees to pay EUR 110,000, which would not cover the loan. The crowdfunding platform, having not received the last few interest payments takes over the property and prepares to sell it. Preparation for sale includes legal actions; preparation for an auction also involves costs (say EUR 3,000). If the borrower fails to repay the loan in time, the mortgage loan contract is terminated and calculation of initial interest, additional interest and delay interest in the amount of 0.05% per day starts (for the sake of simplicity, let’s say that the platform contract provides only for payment of delay interest). Let’s assume that in three years’ time the platform sells the real estate for EUR 150,000. The debt after the sale of the property totals EUR 179,500 including delay interest and legal costs, which means that after three years investors will recover 98% of the loan and will lose all delay interest or interest for the entire period from the termination of the contract and even earlier – from the moment payments ceased until the termination of the contract. This is a very important moment, because it is precisely the reason why the return on investment from mortgage loans during the crisis will be considerably lower than from consumer loans. In addition, the number of such non-performing mortgage loans, compared to the consumer loans, will be relatively higher. It seems that a personal guarantee could help. For example, a person personally guarantees any such loan. In that case the debt he will have to pay after the realisation of the property will be approximately EUR 29,500, because the company had gone bankrupt, while in the case of the consumer loan, legal costs, delay interest and other costs related to debt recovery, and finally procedural interest will continue to accrue. Emotionally this will look like a substantial sum for the borrower and after a further investigation he would probably decide to go bankrupt. Economically, it is worth filing for bankruptcy in Lithuania if your debts are at least EUR 25,000. Even though some people would not declare bankruptcy with such a loan and would try to pay it back, the majority would choose bankruptcy. However, we understand that only a very small portion of business entities agree to provide a personal guarantee for such loans. Looking at the economic pyramid, the person is at the bottom of the pyramid, i.e. the base of it (see Figure 1). When the crisis strikes, naturally, the pyramid will collapse from top down affecting each subsequent section with a weaker force. Even if it hits the population, i.e. the base of economy, the crisis will not destroy it completely. A person may lose his job or otherwise stumble, but it is much easier for him to get back on his feet than for businesses which appear when economy grows and disappear when it shrinks. Figure 1. 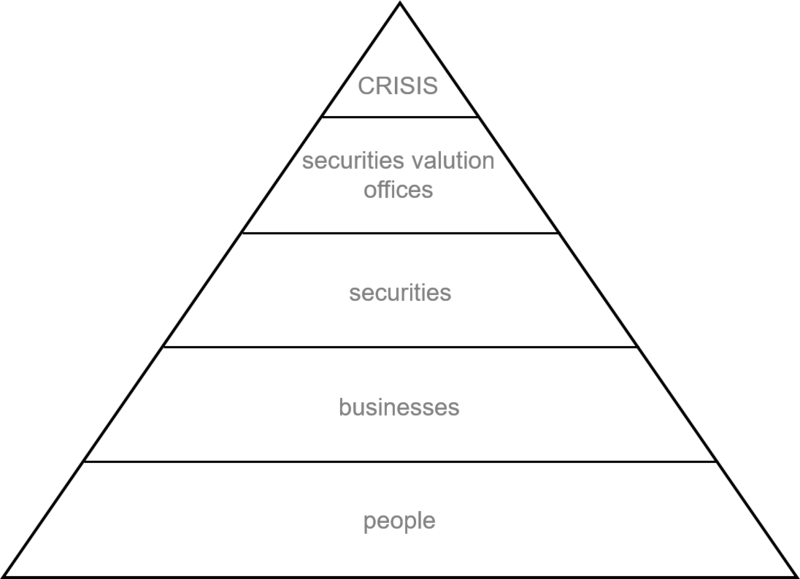 Pyramid of crisis. Made by author on the basis of Exter's Golden Pyramid. Commercial mortgage is far more volatile than consumer loans even when there is no crisis, because the income of a private individual is far more stable than business revenues. In my opinion, therefore, commercial mortgage is riskier and it would be naive to think that the return on mortgage loan would be greater than that on the consumer loan. If during economic growth we can still compare return on both classes of investment, so the crisis will show the outcome of return over a longer term. At least the 2008–2009 crisis clearly showed that the return on consumer loans far exceeded that on other loan products and in many cases remained in a positive zone. In Great Britain such long functioning platforms as ZOPA managed to survive in the profit zone during the crisis, although the return shrunk almost twice. I would therefore urge everyone to diversify their investment and to think which portion of their financial assets to store in different portfolios. Loan risk varies and the difference is smaller at the time of economic growth. During economic decline the situation, however, changes. When investing, one should also think about increasing or decreasing a portion of the portfolio depending on the economic cycle. Return on investment in commercial mortgages during economic slowdown may decrease significantly. That is why when economic decline is anticipated, investors change from riskier classes of investment, e.g. shares, to other, safer investment, e.g. sovereign bonds or raw material assets.